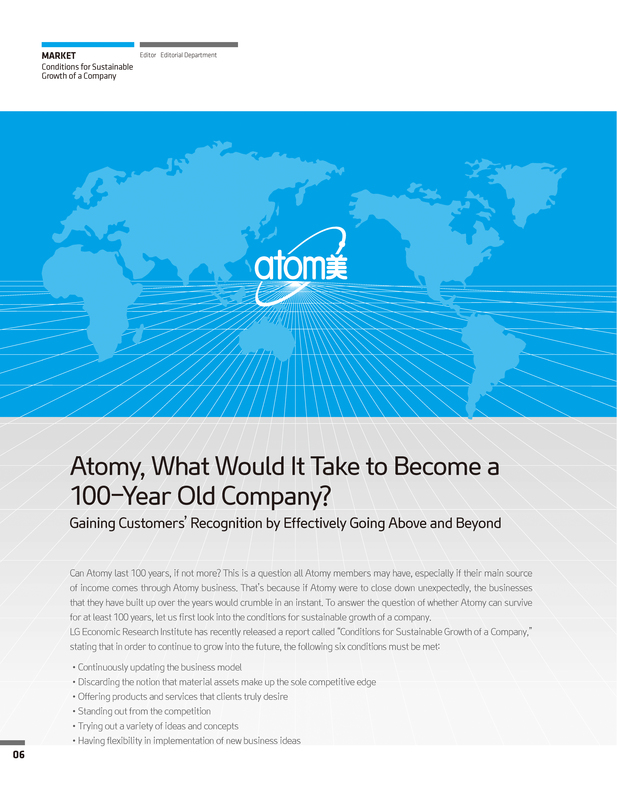 ARTICLE Atomy, What Would It Take to Become a 100-Year Old Company? Can Atomy last 100 years, if not more? This is a question all Atomy members may have, especially if their main source of income comes through Atomy business. That’s because if Atomy were to close down unexpectedly, the businesses that they have built up over the years would crumble in an instant. To answer the question of whether Atomy can survive for at least 100 years, let us first look into the conditions for sustainable growth of a company. One cannot assume that today’s customers and competitors will remain the same tomorrow or even a year later. A company should certainly develop and apply new strategies to keep up with its ever-changing customer base. A company should also adopt new methods to beat the competition. All the while, Atomy never fails to abide by one principle that has always been true with Atomy even though its customers and the competitive environment have changed. That is the Absolute Quality Absolute Price principle of Atomy whose primary business objective is the success of its members. Atomy tries to stay on top of market trends and adapt itself quickly to changes, bringing in new products for its customers based on their needs. Atomy also tries to support its members to succeed by implementing new and innovative services such as the Easy & Easy service and other IT- based services to facilitate their businesses. Atomy’s greatest asset is the sheer determination of its nearly 4 million members across the world, and the will of its employees who work to support them with all their hearts. From the very start, Atomy has never considered its material assets to be its sole competitive edge as a distribution company, and this will continue to hold true moving forward. What customers truly desire is success, whether it be as a consumer or as one doing business through Atomy. Therefore, Atomy needs to become more than just a distribution company that provides its customers with higher quality products at more affordable prices. We should go a step further and do everything in our power to offer services that help our members succeed. This is what we have done in the past, and what we will continue to do in the future. Atomy already has a reputation for standing out from the competition. And this distinction has helped Atomy to grow into a global company with annual sales reaching $1 billion in just 8 short years of existence. 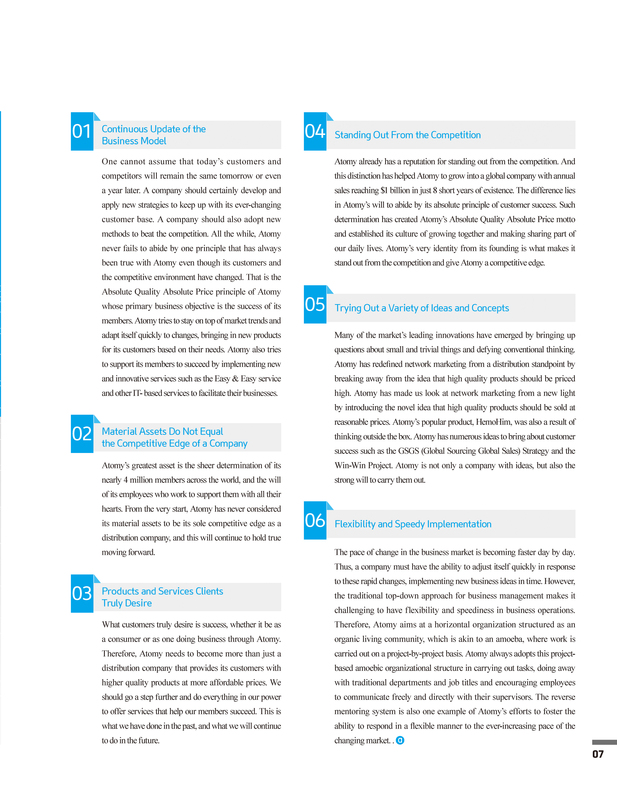 The difference lies in Atomy’s will to abide by its absolute principle of customer success. Such determination has created Atomy’s Absolute Quality Absolute Price motto and established its culture of growing together and making sharing part of our daily lives. Atomy’s very identity from its founding is what makes it stand out from the competition and give Atomy a competitive edge. Many of the market’s leading innovations have emerged by bringing up questions about small and trivial things and defying conventional thinking. Atomy has redefined network marketing from a distribution standpoint by breaking away from the idea that high quality products should be priced high. Atomy has made us look at network marketing from a new light by introducing the novel idea that high quality products should be sold at reasonable prices. Atomy’s popular product, HemoHim, was also a result of thinking outside the box. Atomy has numerous ideas to bring about customer success such as the GSGS (Global Sourcing Global Sales) Strategy and the Win-Win Project. Atomy is not only a company with ideas, but also the strong will to carry them out. The pace of change in the business market is becoming faster day by day. Thus, a company must have the ability to adjust itself quickly in response to these rapid changes, implementing new business ideas in time. However, the traditional top-down approach for business management makes it challenging to have flexibility and speediness in business operations. Therefore, Atomy aims at a horizontal organization structured as an organic living community, which is akin to an amoeba, where work is carried out on a project-by-project basis. Atomy always adopts this project-based amoebic organizational structure in carrying out tasks, doing away with traditional departments and job titles and encouraging employees to communicate freely and directly with their supervisors. The reverse mentoring system is also one example of Atomy’s efforts to foster the ability to respond in a flexible manner to the ever-increasing pace of the changing market.